Dr. Anvay Mulay is Head of the department of Cardiac Surgery at the Fortis Hospital, Mumbai and has an experience of more than 25 years in his field. Dr Anvay Mulay did graduation in Cardiac surgery, and fellowship from UK and USA. 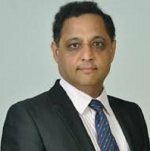 In 1999, Dr Anvay Mulay returned to India as a consultant in cardiovascular and thoracic surgery. Dr. Anvay Mulay has over 25 years of experience and more than 4000 successful heart bypass surgeries to his credit. Dr. Anvay Mulay has done pioneering work in Adult Cardiac Surgery, especially in the field of Coronary Bypass Artery Graft Surgery (CABG). MBBS - GMC, Mumbai, 1983. MS - General Surgery - GMC, Mumbai, 1986. MCh - Thoracic Surgery - GSMC, Mumbai, 1989. Fellowship from UK and USA.